(from BBC News) — The number of people who have fled South Sudan because of the country’s civil war has passed the one million mark, the UN refugee agency (UNHCR) says. Fighting that broke out in the capital, Juba, in July is responsible for the latest surge in those fleeing, it says. More than 1.6 million people are also displaced within South Sudan, meaning about 20% of the population have been made homeless since December 2013. The UN says more than 185,000 people have fled South Sudan since July. “The fighting has shattered hopes for a real breakthrough and triggered new waves of displacement and suffering, while humanitarian organizations are finding it very difficult for logistical, security and funding reasons to provide urgent protection and assistance to the hundreds of thousands in need,” UNHCR spokesman Leo Dobbs said. 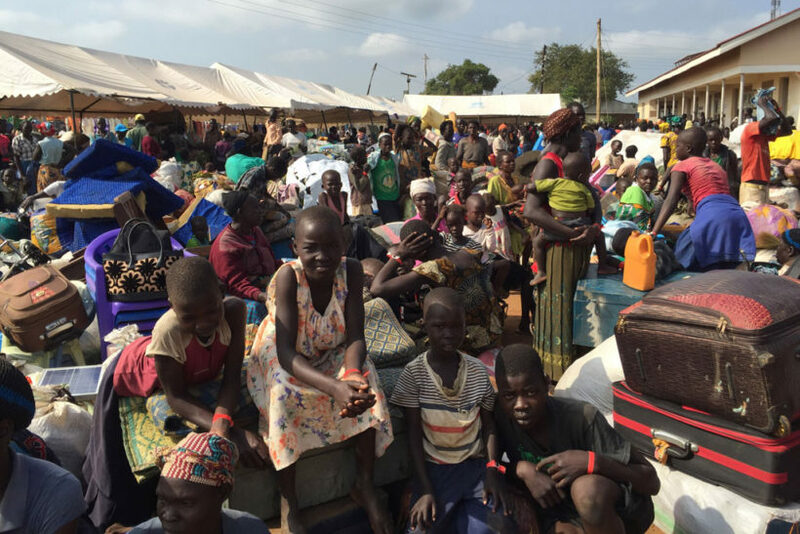 Many of the refugees arriving in Uganda, which hosts the most South Sudanese, are “exhausted after days walking in the bush and going without food or water. Many children have lost one or both of their parents”, the UNHCR says. A fall-out between President Salva Kiir and former Vice-President Machar – the most powerful members of their respective Dinka and Nuer ethnic groups – led to the civil war which erupted in December 2013. 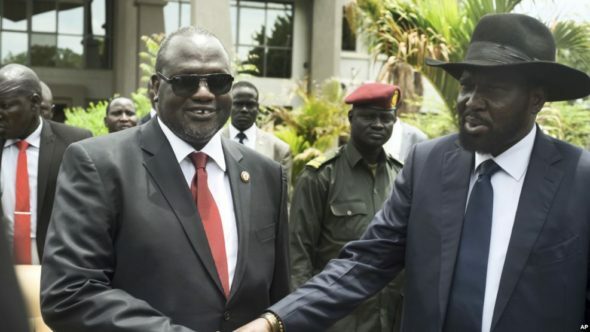 They only agreed to settle their differences under intense international pressure, signing a peace deal in August 2015 – and Mr. Machar returned to Juba as vice-president in a unity government in April. But battles then broke out between his bodyguards and presidential guards three months later, prompting him to flee. Another member of his party has been appointed as vice-president, a move Mr. Machar does not recognize. Earlier this week, a report…accused both Mr. Kiir and Mr. Machar, as well as their officials, of personally profiting from the war. Both men have denied the allegations. The UN wants to deploy a 4,000-strong regional protection force for Juba which they say would have a more robust mandate than the 12,000 UN soldiers already in the country, however the mandate and size of the force still have to be agreed. (from Reuters) — MANILA – Philippine President Rodrigo Duterte said on Sunday he needed six more months for his war on drugs, saying he only realized how bad the country’s narcotics problem was after taking office over two months ago. Duterte, a former crime-busting mayor of the southern city of Davao, won the presidency in May promising to suppress crime and wipe out drugs and drug dealers in three to six months. More than 3,500 people – or about 47 per day – have been killed in the past 10 weeks in connection with the illegal drugs trade, nearly two thirds by unknown assailants and the rest in legitimate police operations, according to local police. Though popular at home, Duterte’s sometimes violent anti-drug rhetoric and the thousands of killings have alarmed rights groups and sparked the concern of the United States, a former colonial power and close ally, and the United Nations. Duterte has dismissed criticism of his war on drugs, including allegations made by rights groups at home and abroad of extrajudicial killings [extrajudicial is without any judicial proceeding or legal process]. New York-based Human Rights Watch (HRW) last week said the U.N. should look into the drugs war and be allowed to interview witnesses. The biggest problem is posed by the distribution and use of locally made methamphetamine, known as ‘shabu’. “I did not realize how severe and how serious the problem of drug menace in this republic was until I became president,” Duterte said in a media briefing in Davao. He said there were “hundreds of thousands of people already in the drug business” now, some of them working in government. “We would need time to put everything in order. Give me a little extension, maybe of another six months,” he said. Early this month Duterte said “plenty will be killed until the last pusher is out of the streets.” But on Sunday he said “even if I wanted to, I cannot kill them all because the last report would be this thick,” referring to a new, not yet published list of mostly public officials linked to illegal drug trade. 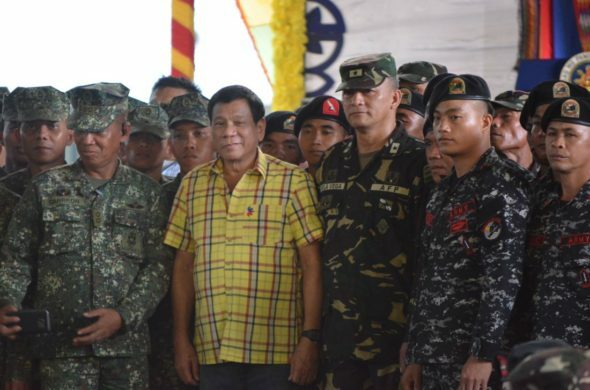 In two previous lists, Duterte identified military and police officials, lawmakers and judges with alleged connections to the drug trade. He also said he supported calls to postpone the barangay elections, to be held in October, because drug money could be used to ensure victory of those who connive with drug dealers. “From the looks of it, it’s the government already doing the operation (of illegal drugs). They (the foreign critics) just don’t realize it because it’s not their country,” he said. (from London’s Daily Telegraph) — MOSCOW – Russia plans effectively to revive the KGB under a massive shake-up of its security forces, a respected business daily has reported. The MGB is expected to be in operation before the 2018 presidential elections, which could see Mr. Putin secure a fourth term of office that would keep him in power until 2024. Mr. Putin served as a KGB officer in Soviet-era East Germany, and is also thought to have been responsible for keeping tabs on dissidents in his hometown of Leningrad, now St. Petersburg. He headed the FSB from July 1998 to August 1999, before becoming prime minister, and has often quipped that there is no such thing as a former KGB officer. 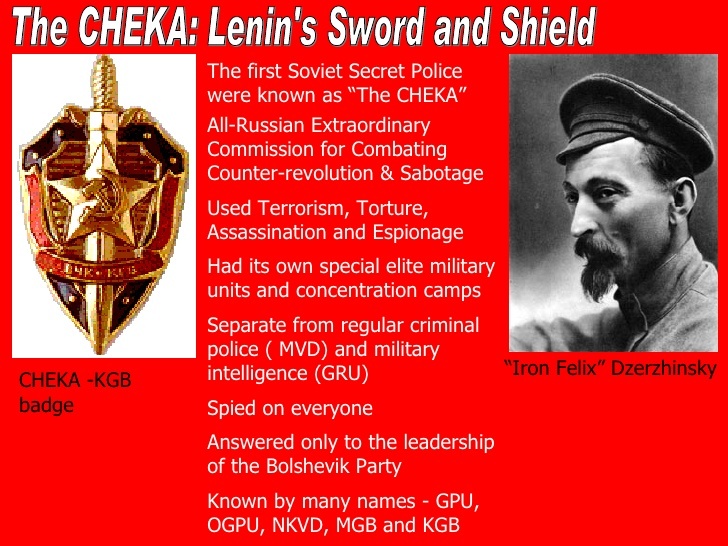 “The KGB was one of the strongest special services in the world – everyone recognized this,” Sergei Goncharov, who served in Russia’s now disbanded Alpha counter-terror unit in the 1990s, told state media. Mr. Goncharov also said the creation of the MGB would provide Russia with a “strong fist” overseen by a unified leadership. The Kommersant report came less than 24 hours after Mr. Putin’s ruling United Russia party strengthened its grip on the Duma, the lower house of parliament, taking three-quarters of its 450 seats, its largest ever majority. The two anti-Putin parties on the ballot – Parnas and Yabloko – failed to overcome the 5 per cent threshold to enter parliament. Dmitry Gudkov, the only liberal opposition politician to hold a seat before, was defeated by a United Russia candidate. “The question now is … how to live with a one-party parliament,” he said. The election was marred by allegations of vote-rigging and widespread apathy. The turnout in Moscow was just 35 per cent, the lowest since Mr. Putin came to power in 2000. “A record low turnout. Democrats get less than 3 per cent. The MGB is to be recreated. Welcome to the brave new world,” said Vladimir Kara-Murza, the deputy leader of Parnas. b) In addition to the 1 million South Sudanese who have fled the country, how many are displaced from their homes within the country? c) What caused this civil war in South Sudan? d) Read the “Background” below the questions. To what countries have the Sudanese refugees fled? e) There is much in the news about the plight of Syrian refugees. 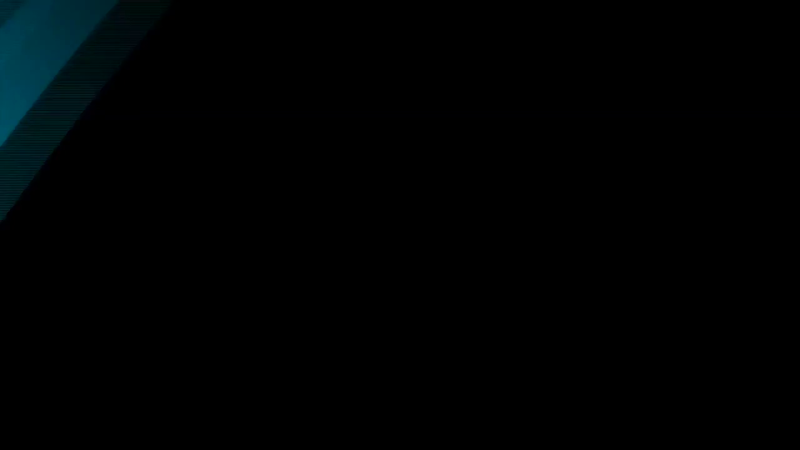 Why do you think the media chooses to focus on the millions of refugees from Syria but not as much is reported on the horrible plight of the Sudanese refugees? f) During various African conflicts/civil wars, refugees are moved to camps within their own country, or when not feasible, to camps in neighboring countries, with the goal of ending the conflict so that people could return to their own homes. Why do you think Western leaders on the left are calling for millions of Syrians to be resettled in Europe and the U.S., far away from their borders and their culture? Explain your answer. g) If there was a civil war in the U.S., would you want to be resettled in Europe and the Middle East? Explain your answer. h) How might world leaders (the UN) be able to compel the president of South Sudan to end this civil war? b) Before being elected president, what political experience did Duterte have? On what promise was he elected president? c) Why are human rights groups concerned over President Duterte’s war on drugs? d) Who has President Duterte accused of being connected to the drug trade? “Nicknamed ‘the Punisher,’ Duterte’s folksy ways and unbridled tongue are shrugged off by some as honest and natural. Others call him a patriot with a genuine love for the poor. Many praise him for his war on drugs, which began while he was the Mayor of Davao, a city in Mindanao. The Davao Death Squad, a vigilante group, was responsible for the execution of individuals suspected of petty crimes and drug dealing in Davao. Still, people like to cite how clean and safe Davao is because of Duterte. Following criticism from the United Nations that extrajudicial killings had increased since he took office, Duterte threatened to withdraw the Philippines from the UN and form a new organization with China and African nations. How do you think world leaders should respond to President Duterte’s threats? 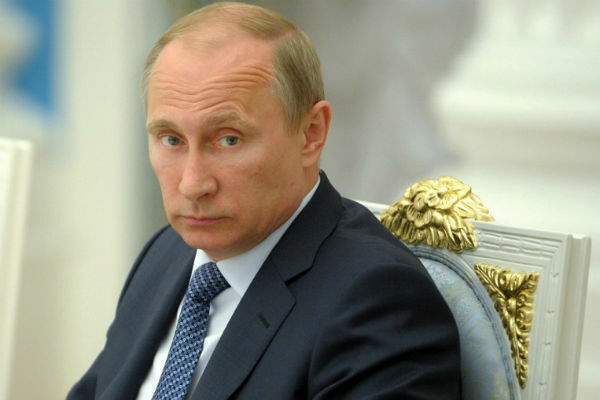 b) What association does Vladimir Putin have with the KGB? c) What accusations were made by critics of this recent parliamentary election? d) What was voter turnout in Moscow for this election? DR Congo: 40,000 – current influx is to Ituri province. On December 15th last year, conflict broke out in the South Sudanese capital, Juba, among members of the South Sudanese People’s Liberation Movement (SPLM). The fighting, between those who supported President Salva Kiir, a member of the Dinka tribe, and recently ousted Vice President Riek Machar, a Nuer, has sparked a major humanitarian crisis. When Sudan gained its independence from Great Britain in 1956, it was with the understanding that the southerners (mainly Christian) would be able to participate fully in the political system. 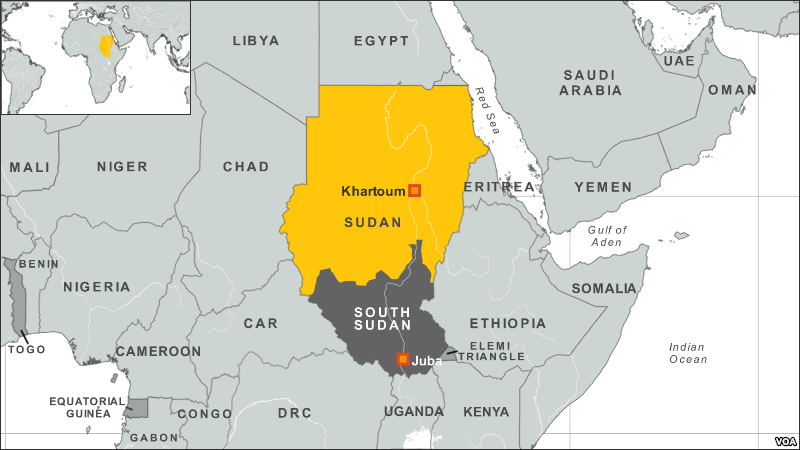 When the Arab (Muslim) Khartoum government reneged on its promises and used the Janjaweed – government-backed militias who were notorious for brutal attacks against civilians in Darfur – this led to two prolonged periods of conflict (1955-1972 and 1983-2005) in which perhaps 2.5 million people died – mostly civilians – due to starvation and drought. 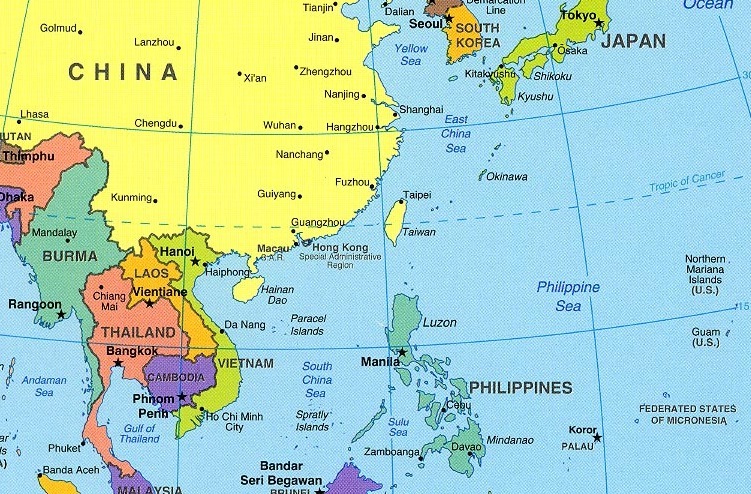 Ongoing peace talks finally resulted in a Comprehensive Peace Agreement, signed in January 2005. As part of this agreement, the south was granted a six-year period of autonomy to be followed by a referendum on final status. The result of this referendum, held in January 2011, was a vote of 98% in favor of secession. Since independence on July 9, 2011, South Sudan has struggled with good governance and nation building and has attempted to control rebel militia groups operating in its territory. Economic conditions have deteriorated since January 2012 when the government decided to shut down oil production following bilateral disagreements with Sudan. In December 2013, conflict between government and opposition forces led to a humanitarian crisis with millions of South Sudanese displaced and food insecure. The warring parties signed a peace agreement in August 2015, which calls for a transitional government of national unity, but its formation has been delayed as of early 2016.